Before I start chattering about the card, I would just like to say that thank goodness I treated myself to an external flash for my camera recently! I still prefer to take pictures in nice lighting, but at least I have an alternative now. What do you think? Back to the card! I started out by stamping out my deer. 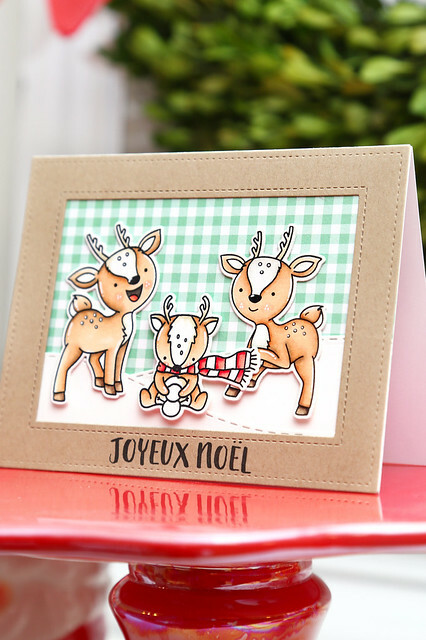 The mama and papa deer are from Oh Deer, and the little one making a tiny snowman is from Santa's Wonderland. I think they all look so cute together! I colored them all using my favorite brown copic marker trio: E30, E31, and E34. I went back in and added some W5 in the spots that would be most shaded. I added rolling snowbanks beneath their hooves, using our Stitched Slopes dies. I added a gingham paper sky and popped up the focal images before creating a frame using 2 rectangle dies from Lawn Fawn. I stamped out the greeting, from Nativity Play to the bottom of the frame using a crisp black ink. 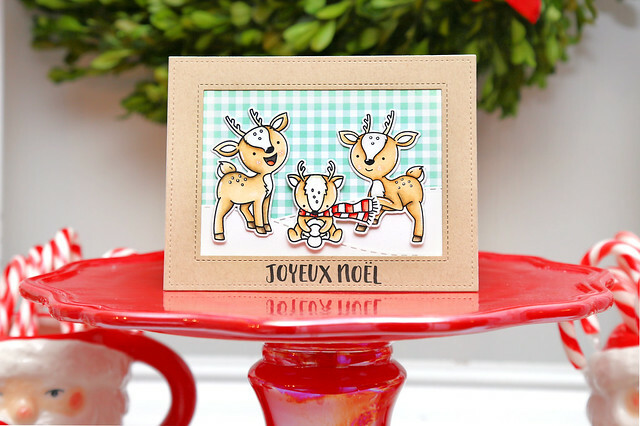 I'm so happy to have this french greeting for all of our teacher cards this year! We live right outside the city of Montreal, and our kids are in a french-immersion program.